Yet measuring methane emissions has been an elusive science. Methane is a colorless, odorless gas that packs a powerful punch: Methane has 84 times the global warming potential of carbon dioxide in the short term. Livestock emit methane in two ways. One is via enteric fermentation, the natural digestive system of cows and other ruminants that causes substantial burping. The second is via manure, especially when that manure is stored in a liquid system. Currently, the EPA has only estimates of how much each pathway produces, based on per cow averages of biological factors adjusted for different regions. However, farmers have neither proven tools to determine their methane emissions nor information on how best to minimize those emissions on their farms. Globally enteric fermentation is the biggest source of methane from livestock farming. On California dairy farms, however, manure may be a larger source of methane emissions because of a practice of storing manure in liquid systems. EDF pioneered tools to measure methane emissions from oil and gas exploration – the largest source of U.S. methane emissions – through 16 independent scientific studies. The precise measurements that resulted have facilitated efforts to reduce methane emissions from oil and gas operations. Now, EDF is using its knowledge to test ways to measure and inventory emissions from livestock operations. Earlier this year, we conducted initial investigations at two dairies in California. In this study, EDF relied on three methodologies to measure methane: one taken by aircraft above the dairies and two using different methods taken on the ground. This comparison is intended to help clarify differences in reported emissions and establish a clearer baseline for emission reductions. While the data are not all in, the clock is ticking. 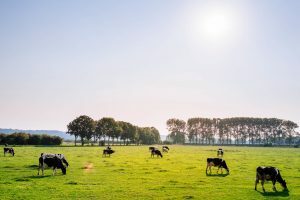 California legislators this fall passed a law requiring the state’s dairy farmers to reduce methane emissions from manure management operations by a target of up to 40 percent of 2013 levels by 2030. The law tells the state Air Resources Board to issue rules on manure emissions and include enteric fermentation emissions once mitigation technologies become available. In California, one of the efforts is focused on capturing manure methane in biogas digesters and converting the gas into energy. As a part of the revenue from the state’s cap-and-trade program, the state set aside funds to help farmers build them. But digesters are costly, so farmers would need additional investment capital to install them, and they’d need to forge contracts with utilities to buy the energy produced. Digesters are just one piece of the puzzle: we need to pursue other efforts to mitigate dairy methane emissions, such as using manure as fertilizer. Allowing manure to dry prevents it from emitting methane, but it piles up so farmers need a way to manage it. Research in both capturing and preventing manure methane emissions could produce multiple strategies for farmers to choose. Through our experiments on dairy farms, EDF and its partners hope to better understand the methane amounts released by both enteric fermentation and manure management. Once researchers have a better understanding of amounts emitted by these sources and the best way to measure them, they can begin to measure reduction potentials of proposed mitigation options. Then, farmers can identify the most cost-effective strategies to reduce methane emissions in California and beyond.